He stood before President Sebastián Piñera and, chief to chief, said, "I hope that this will never happen again." And also, "I'm proud to live in this country." Later, Chilean miner #33, Luis Urzúa, hugged Piñera, gave a big hug to Andrés Sougarret, engineer for the Corporación del Cobre [Copper Corporation], gave a giant hug to his son, spoke with them all and with others, and broke medical protocol. For him there would be no stretcher, no urgency. 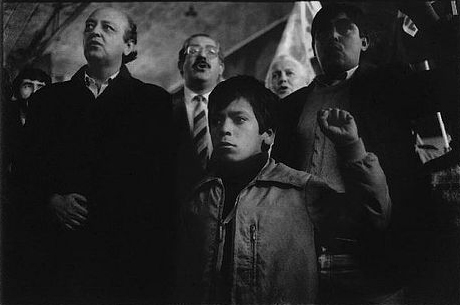 He ended up singing the national anthem, the hymn that describes Chile as the "tomb of the free" or the "refuge against oppression." If one were to judge it by the life of Urzúa, the way it was described for the daily El Mundo de España by journalist Jorge Barreno, until last night his country was more of a tomb than a refuge. Urzúa's father was labor union director of the Communist Party. He became one of the "disappeared" at the beginning of the dictatorship of Augusto Pinochet, who on September 11th, 1973, overthrew Salvador Allende. His stepfather, Benito Tapia, was a copper miners' union leader and member of the Central Committee of the Socialist Youth organization. In October of 1973, he was murdered in the Copiapó cemetery and buried without a casket in a mass grave, together with two of his comrades. He was one of the victims of the Caravan of Death, the extermination squad that left Santiago in a helicopter with orders from general Sergio Arellano Stark to selectively murder social leaders and those who held office during the Allende government. Tapia was 32-years-old. Luis Urzúa was barely 17. Luis Urzúa, who NASA advisors described as "a natural leader," is now 54 years old and has been a miner since 1979. He was the most experienced of the 33 miners who were trapped below ground, and it was he who organized them after the collapse and who resolved, as he elegantly described it to Piñera, "to administer the supplies." He also told how, when rocks blocked the shaft, the first thing he asked was about the fate of the others. They were spared, but he and his companions did not know it yet. They were beneath a sea of dust that took three hours to clear. And, he did not trust the owners of the mine. "When we heard a noise some days later, we thought that they were still working the mine," said Urzúa. That is, he was thinking that they were not looking for survivors among the miners, but rather for more copper, given that the metal that Allende once called "the wages of Chile" had just reached its highest international price in the last fifty years. History is not a straight line. Allende nationalized the large-scale copper mines (but not the San Jose mine, which in Chile is considered mid-scale) in 1971, naming one of his young advisors, Jorge Arrate, to head the state copper corporation, Codelco. The nationalization sped up the coup d'etat. 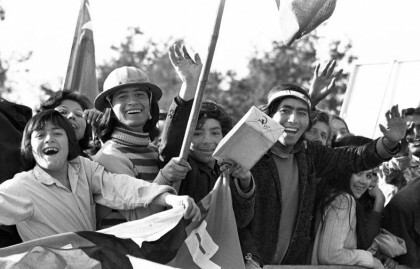 Pinochet reversed most of Allende's economic decisions, but he did not re-privatize copper, which continued to guarantee the flow of foreign exchange earnings for Chile and financing for its Armed Forces. Pinochet even wrote it into law. Codelco continued to train technical cadres and to pass on skilled trades and technical knowledge, and during the past two months was able to successfully organize a rescue which the private sector was totally incapable of managing. And down below, 622 meters below the parched surface of the Atacama Desert, one day a son of the victims of the dictatorship would write a note giving the news that the 33 were alive, and would organize a daily routine, and stay on alert even when the morale of the group was flagging. Nelly Iribarren, his 78 year old mother, said that "I was imagining how my dark-skinned son would be making the rounds of the shelter, making lists for his comrades, rationing the food and assigning them tasks, because that's how he is, bossy but orderly." She described Urzúa as "very disciplined," and said that "in the house, he was the one who always took the lead among his seven brothers." A society with an authoritarian tradition and which sometimes seems divided into castes, Chile has not treated its workers well, and in fact went on the rampage against them, against their lives, their organizations, their wages, their working conditions, since 1973. But for a miner, it is no surprise how another miner lives. Mario Castillo, union leader of the Rio Turbio state-owned mines, remembers that when he began working they would still bring a canary down into the mine. "If the bird was able to live, there was enough oxygen," he said. "Or, we would light a flame and check the color to see if there were any dangerous gases in the atmosphere." In June, 2004 fourteen workers died in the Rio Turbio mine. The corporation, property of Sergio Taselli, had been running the mine since 2001, shrugged off any responsibility. "Safety improved after the accident," says Castillo. According to the International Labor Organization, currently headed by Juan Somavia, a Chilean, there is data to suggest that more than two million people die each year around the world as a direct result of their working conditions or due to illnesses contracted at work. Nobody can seriously contend that just televising the problem from Copiapó to a billion people is going to solve the problem. But if political and labor union action can be successfully dovetailed with public disclosure, we will have one thing in our favor: the rescue that was completed last week showed the world how the life of a miner really is, and the kind of risks he faces when corporate profits take priority over worker safety. For this reason, we owe a special toast to Luis Urzúa, miner number 33, the last of the group to leave the shaft, the last one to whom they shouted "Chichichi/lelele/ miners of Chile!" Translated by Owen Williamson from Argentina-based Pagina 12.